I will get to play in Blogger Bracelet Race tourney today. My drive home today was a lttle obstructed due to what 511.org called a traffic accident that would take an estimated 2 hours to clear. Follow link to AP Photo/Paul Sakuma to form your own opinion of how long it takes to clear wreckage of burned gas tanker. Playing a $10+1 FTOPS Avatar Satellite and was victim of this wonderful bit of Fonkery. Apologies for not have real hand history. Not happy with 3 callers but flop of Q 9 2 rainbow is ragged enough, After 2 checks I bet 380. I call because even if he has Q 9 I figure I am priced in. Fonkey is rewarded with turn K and River 8. Had seen him raise KKxx pre-flop 3 times and bet out low draws thought I was ahead for high, let's see if there is no low. If I was Wawfuls I would create a post extolling the brilliance of my play in the Mookie last night. Playing my cards brilliantly on my way to finishing 2nd. But after scraping to Final Table I was a card rack lucksack. 1st LoveElf dared to try to put me out 9th with mere Aces and my KK sucked out on the turn. Then down to 3 handed got caught trying to steal Smokkee 's BB from SB with 85 (sooooted). Smokkee apparently failed to learn from Elf's mistake and pushed with AA only to see me river a straight to put him out. Hopefully neither LoveElf or Smokkee screamed out my name during their post Final Table treats. The people who want to buy my house have finally found a lender willing to loan them 90% of the money they need to purchase. Sadly they need a 10% 2nd mortgage that they have not found a lender for. Their latest offer and according to their realtor only way they can complete transaction is for me to act as 2nd lender. Most amusing part of offer to me is that their realtor is also a mortgage broker. He does not want to make secondary loan to his clients for 10% of purchase price when he gets an immediate 3% payoff in commissions when sale goes through. Don't think I need to see their credit report to make this decision. Realtor/Broker's actions speak volumes. Can't say mindset was good for poker tonight, Wednesday has to be better. Thank you for contacting Full Tilt Poker Support.In normal multi table heads up tournaments, players have to wait for all games to be done to move onto the next round. Since this was a private tournament the structure was different. Player oossuuu754 had already eliminated three other players by the time you finished your game against mookie99, this is why you were out chipped 3 to 1. Thank you for your cooperation, and if there's anything else we can help you with, please let us know. It is of course the best drawing hand. 1st hand Nordberg lost half his chips with AK, flop was AK small, turn was T, river was J to South African who claimed to have pocket Aces. Early in 2nd level Owen busted out to guy in Seat 9 who was clearly tightest player at table in a blind vs. blind situation when after a K92 rainbow flop and Ace on turn he discovered his AK had run into an AA. Later in 2nd round after one caller I was inspired to limp (200) with AhKh suited (the hand of death at my table) and Tim raised to 1200 and I called on flop of Kc 6h 4h we got all chips in on flop and Tim had AdKd but no hearts came. End of 2nd round I had AK in BB, tighest guy at table raised and I called OOP to see KK4 rainbow flop and I took down a decent pot with a check raise as I was sure he had decent pair and did not want to be blind to if he hit boat (he later told me he had Aces). After writing this down I can see Blinder's and Hoy's point. All of these hands were raised preflop. We were joking during 2nd break that AK was a "cooler" for everyone at the table but me but also noticed I had called with it while they had all raised with it. None of these calls represented more than 1/20th of my stack. If I've achieved nothing else this week at least I have increased range of hands I will limp with in a blogger tournament. Could have folded to Final Table but decided to race from BB with pocket 4s, SB had pushed with a Q 5 and hit both. My apologies to hoyazo for my improper hammer play technique, Gephardt80 (judging by his blowing up with huge chip lead this may be a SirFWALGMan multi-account situation) min-raised UTG. He had been raising large every hand he had called anyone's re-raise for 4 orbits so I meekly called to hide the strength of my hand. I checked the flop and he obliged with a push. I was disappointed that he had garbage but table enjoyed Hammer Drop. I play so fawking bad some nights. someone already has the boat. bayne_s: 1 0 how smart do you really have to be? Limped with a suited AK at Aussie Millions in from cutoff in Level II. Liked the result after flopping K and 2 small of suit and got Tim West (TMAY420) all in with an AK of his own. Freeroll did not come in for me but it prompted discussion amongst the real poker players at next break. SirFWALGMan: did anyone notice those low paying jobs have worker gangs? Just finished reading part III of Violent Acres posts of how she became a 15 year old bride. I have been reading her blog for a few months and was fascinated with level of anger/outrage that is carried within or beneath the surface and now I understand the basis of anger and bond I have felt. I am fortunate that my own immediate family was only a little dysfunctional. My father has his flaws but they pale in comparison to his eldest brother who was beloved by the community at large while beating his wife and abusing his kids. When he put his house up for sale one time to move on it was bought by the next door neighbor who burned it to the ground as he "Never wanted to have neighbors like that again". When he did die (from a self-inflicted shotgun blast) my 1st question was did he take anyone else out with him, I was not only relative who asked this. Christopher Titus claims in his act that Dysfunctional Families are now the Majority. I implore my 6 blog readers that if you suspect that someone you live near is abusing their children or spouse Help Them. Call the police, social services or local schools where children are in attendance. Victim (Observer): the call of the donkey. "they were sooooted"
Let's see if I am understand this. You re-raise with KQ off from SB for all YOUR chips with a raise that is less than 3/4 of a min raise. I get 4:1 pot odds to call and you think I am the donkey. 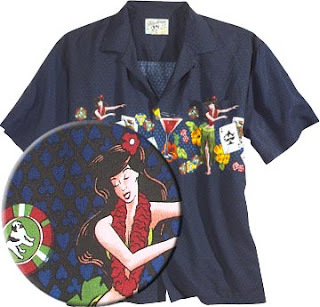 They have many other poker themed shirts available but I think going with the tourist on vacation playing poker look is +EV. Celebrated Good Friday by playing in an $8.80 satellite to the Sunday $400K Guarantee. This of course led to celebrating Easter by playing in the $400k. During course of tournament I had a pair above 99 once (QQ) until very late (KK). As a homage to Hoyazo some screen shots are included. The key hand that got me into the money was an AK suited. Can't find the hand history but I was BB (1600) with 3400 behind, ~330 left, 306 paid. Button made pot raise, SB went all in for 15k I called, button folded. SB had 10 10 and flop was AK small, turn was J river was small. I then folded to the money as cards were awful. I play a little tight but I do play more than top 10% hands saw a lot of hands that were better for doubling down at BlackJack than playing Hold'em with. Was at an aggressive table that had chip leader on a card rush, UTG was my only chance to be 1st all in and cards were awful. Was given a gift in BB when down to 1616 with BB at 1600 when one of the mainiacs raised with Q3 and I had QJ and flopped 2 jacks. This gave me a chance to risk tourney with. Was bottom 10 in chips most of the time once we got to 2nd money level and went out 98th (bottom of a money cutoff though) when UTG with 5x BB I picked up 88. On this action a JackAce in SB called off half his chips. At least this fawking time I got in with them against a shorter stack. A friend of mine that started my slide into gambling via Horse Racing has convinced me to meet him in Vegas in 15 days. His current focus is Video Poker so we are staying at The Cannery. What do I need to know? All previous trips I've stayed mid strip or Rio. If Miami Don wants to meet up to explain how any 3 cards in Razz can include KQQ even when I'm all in to complete or any one else wants to say hello you can contact me at send_all_stinking_spam_here (at) yahoo (dot) com. Gawd Dam Full Tilt Poker's RNG screws me over when I get KK. But the Bad beats to knock me out keep coming. 8 hands prior to my last Columbo tries to steal my BB with a raise greater than 1/2 his stack with QT off. I wake up with KK in BB and push, Columbo getting ~4:1 on his money makes the call and is rewarded with 6-T straight thanks FTP RNG. Manage to double up twice to get back to decent stack when Iakaris decides to raise my BB with KJ off. I wake up with KK again and push. Iak being at the high end of his raising range decides to call getting ~2:1 on his money and applying his own re-raising hand range to me. FTP RNG of course rewards his 10% play and IGH. Please apply everything Hoy has ever said about AJ to KJ people.